L. David Marquet, a top graduate of the U.S. Naval Academy, commanded the nuclear-powered, fast-attack submarine USS Santa Fe from 1999 to 2001. Since retiring from the Navy he has worked with businesses nationwide as a leadership consultant. 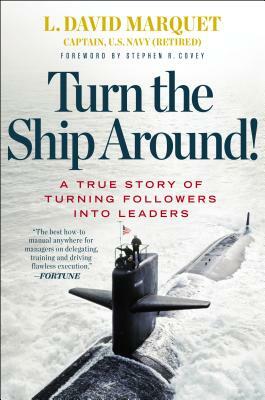 He gives presentations around the world and has also written a companion workbook called Turn Your Ship Around. He lives in Florida with his wife, Jane. "This is the story of Captain David Marquet's unprecedented experiment in the most rigid of environments on the Santa Fe, a U.S. Navy nuclear-powered submarine. He had the courage to operate counter-culture, reengineering the very definition of leadership accepted by the U.S. Navy for as long as it has existed. He took huge risk to do this. The outcome was revolutionary - within a few short months, the crew of the Santa Fe went from worst to first. In today's information age, Human Capital is our most precious resource. It is the 21stCentury weapon of choice. Captain David Marquet's experiment in leadership has far greater application to the entire business world. This is thought leadership." -- Charlie Kim, Founder & CEO of Next Jump, Inc.
"David Marquet's book discusses 'successful motivation' that provided his people the energy to overcome difficult obstacles. The values that he imbued in his folks provided a 'burst of energy' that positively energized them by satisfying their needs for achievement, providing appropriate recognition, providing a sense of belonging, developing self-esteem, permitting a feeling of control, and permitting an ability to live up to appropriate standards. This type of leadership energizes the work force and allows senior management to 'paint the future and light a path that takes the entire team to it.' This is a must read for all who desire good moral influence on the work force!" -- Vice Admiral Al Konetzni, (USN, ret.) Former Pacific Fleet submarine commander.